1Department of Biochemistry, School of Biological Sciences, University of Cape Coast, Cape Coast, GHANA. 2Department of Mathematics, College of Science, Hohai University, Nanjing, CHINA. 3Key Laboratory of Integrated Regulation and Resource Development on Shallow Lakes, Ministry of Education, Environmental Engineering Department, College of Environment, Hohai University, Nanjing, CHINA. 4Chemical Engineering Department, College of Engineering, Kwame Nkrumah University of Science and Technology, Kumasi, GHANA. 5Department of Laboratory Technology, School of Physical Sciences, University of Cape Coast, Cape Coast, GHANA. 6Clinical Research Laboratory Department, 37-Military Teaching Hospital, Accra , GHANA. Introduction: Phytochemicals are frequently used in chemotherapeutic treatment or may be used as chemo preventive agents with chemoprevention. The study report the quantification of phytochemical constituents and vitamin C contents from ethanol extracts of Solanum torvum fruits. Method: The main objective for this research was to use standard procedures to determine phytochemical and vitamin C content. Results: The estimated alkaloids found in mature fruits were 6.32 ± 0.12 mg/g and 16.94 ± 2.3 mg/g in the immature fruits. Total saponins in mature and immature fruits were 8.60 ± 2.6 mg/g and 16.90 ± 9.4 mg/g respectively. Total flavonoids in mature and immature fruits were 21.14 ± 4.4 mg/g and 14.24 ± 1.8 mg/g respectively. Also vitamin C contents were 11.79 ± 2.0 mg/g in mature fruits and 8.70 ± 0.26 mg/g in immature fruits. With the exception of alkaloids whose difference in the mature and immature was significant, other differences obtained were not significant. Conclusion: The study showed that the extracts contain diversity of phytochemicals in appreciable amount that can expertly keep the body against oxidative stress triggered by free radicals and therefore be used as a source of potent natural products. 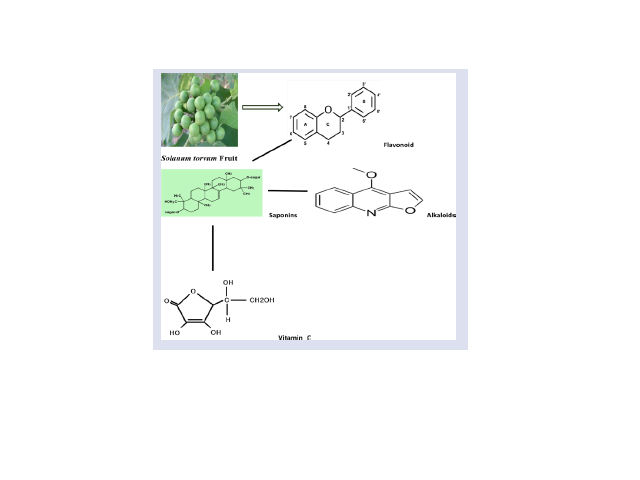 Koomson DA, Kwakye BD, Darkwah WK, Odum B, Asante M, Aidoo G. Phytochemical Constituents, Total Saponins, Alkaloids, Flavonoids and Vitamin C Contents of Ethanol Extracts of five Solanum torvum Fruits. Pharmacognosy Journal. 2018;10(5):946-950.